Traveling in New York — and blogging on the fly — I read an interesting book review in the Wall Street Journal this morning: Newsday's Daniel Akst reviewing Sincerity by R. Jay McGill Jr. — a book about how the idea of sincerity developed and whether honesty is good for society and, if so, how much. 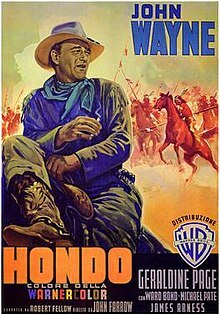 The review put me in mind of the old John Wayne western Hondo — a 70-minute long adaptation of a Louis L'amour novel, sort of a rip-off of Shane but well worth while all the same. The thesis of the story is that Wayne, a friend of the Apaches, has learned their highly truthful ways and essentially has to learn to tell the "noble lie" in order to join white civilization. Wayne laments the death of the more honest Apache way: it was a good way, but its time has passed. Compare this with Fort Apache, also with the much-maligned-by-leftists Wayne, in which the Apaches, led by Cochise, come off as peaceful and reasonable people abused by dishonest US government agents and by Henry Fonda's martinet cavalry leader. In both these excellent films, we see a nuanced portrayal of Apaches and white men both. No one has a monopoly on decency. Red and white humans are both humans, given to corruption and war. Now read these remarks by anthropologist Keith Basso in the Wikipedia entry for "Apaches:"
"Of the hundreds of peoples that lived and flourished in native North America, few have been so consistently misrepresented as the Apacheans of Arizona and New Mexico. Glorified by novelists, sensationalized by historians, and distorted beyond credulity by commercial film makers, the popular image of 'the Apache' — a brutish, terrifying semi-human bent upon wanton death and destruction — is almost entirely a product of irresponsible caricature and exaggeration." This is not to pick on Basso, who no doubt has examples at hand. But I do notice that with cowboys and Indians, as with men and women, the usual, generally leftist, attacks on old-time Hollywood simply don't hold up. Hollywood Indians of the 40's and 50's were often portrayed as flawed humans under attack from other humans, equally flawed. Likewise, while feminists always complain that women in old films are either bad girls or good wives, I'd be willing to bet there are more hard driving, high powered career women in 40's and 50's films than there actually were in the 40's and 50's. Compare this to films today, where "noble savages" are typically the victims of demonic white invaders and women are almost nothing like real women, but either ridiculously powerful warriors or unbelievably happy sluts. Political correctness poisons everything it touches with dishonesty. But perhaps the honest ways of 40's and 50's American films have come to an end like the ways of the Apache!